Bonnie and Clyde (or Clyde and Bonnie, if you asked him) were a couple of American outlaws who captured the attention of the public in the early 1930s. While these two kids weren’t much more than a couple of petty robbers, commonly knocking over gas stations and small “mom and pop” stores, the media glamorized their exploits into legend. And now legend has become musical. Following its short run on Broadway, New Line has once again seen the potential in an unappreciated show – and has given it a new and glorious life! Both newcomers to the company, Larissa White and Matt Pentecost play Bonnie and Clyde. The two leads share a phenomenal chemistry, as well as an energy that lights up the stage. Each of the actors hold their own in vocals and acting, but when they come together it is magic. 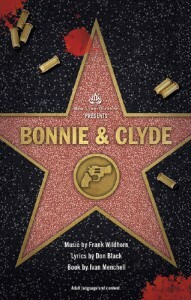 The story starts off before the two of them met, with Bonnie’s dreams of being in the “Picture Show,” and Clyde trying to stay out of jail while singing about how “This World Will Remember Me.” The show then chronicles their relationship from their humble beginnings to making the headlines. Joining them are Clyde’s brother Buck (Brendan Ochs) and his wife Blanche (Sarah Porter), who both do a great job of providing the comedic relief in the show. Hot on their trails are Ted Hinton (Reynaldo Arceno) and Sheriff Schmid (Christopher Clark) who relentlessly track down the outlaws throughout the show. 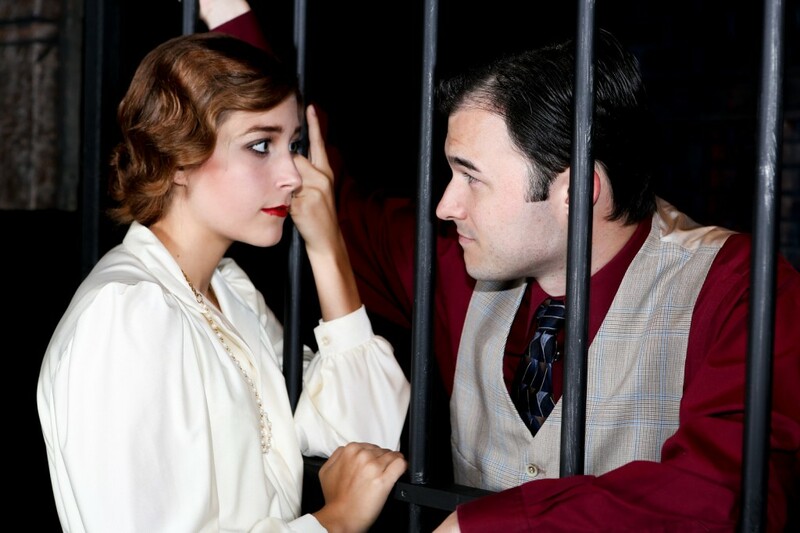 Larissa White and Matt Pentecost in New Line Theatre’s ‘Bonnie and Clyde.’ Photo Credit: Jill Ritter Lindberg. New Line veteran Zachary Allen Farmer steals the show, as he tends to do, every time he comes on stage as a local preacher. Farmer’s energy is explosive as he belts out “God’s Arms Are Always Open” with the rest of his congregation. He also does a fantastic job leading “Made in America” with the rest of the ensemble. There is no question as to why the versatile actor keeps ending up in the cast for shows at New Line, and it’s always a pleasure to watch him perform. 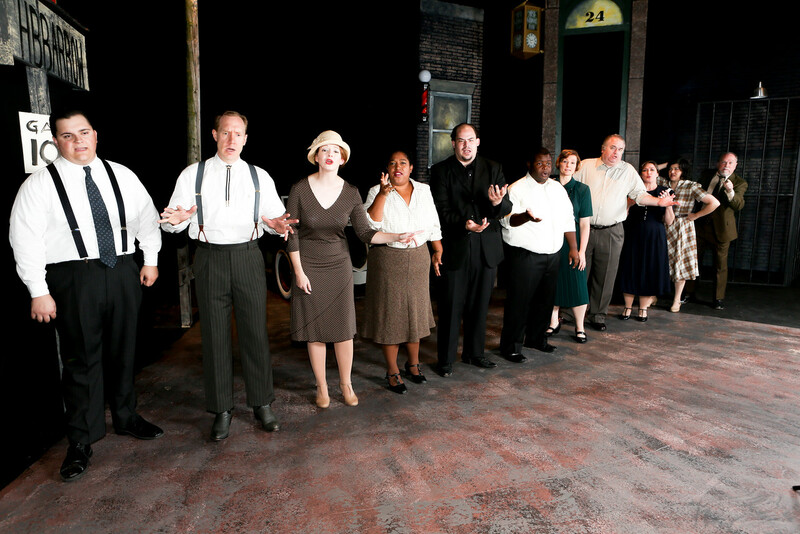 The Cast of New Line Theatre’s ‘Bonnie and Clyde.’ Photo Credit: Jill Ritter Lindberg. Rob Lippert, who produced the beautiful red pickup truck for ‘Hands on a Hardbody,’ has once again crafted a stunning vehicle to be used on-stage. 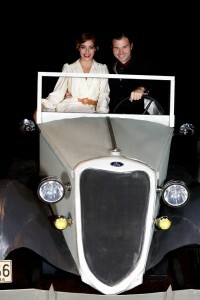 The show opens and closes with the titular duo in the car, and also showcases their main mode of transportation throughout. Lippert is also responsible for the scenic and lighting design, which is beautiful. This may be one of my favorite New Line sets yet. Artistic director Scott Miller has a knack for choosing musicals that you probably haven’t heard of, but won’t soon forget. The music of ‘Bonnie and Clyde’ is no exception to this rule. The New Line band, directed by Jeffrey Carter, does a fantastic job with the music for the show. Aside from the aforementioned tunes, numbers like “When I Drive” (featuring a fantastic sequence between Clyde and Buck), “Raise a Little Hell” and “Too Late to Turn Back Now” will stay with you long after leaving the theatre. Bonnie and Clyde in the car designed by Rob Lippert. Photo Credit: Jill Ritter Lindberg. ‘Bonnie and Clyde’ is a cool show, and yet another surprise from the company who knows how keep their choices interesting. The entire cast does a terrific job in this public enemy period piece, bringing the story you think you knew to life through music and dance as only New Line can. The show is a time warp back to the 30s, with terrific music, scenery and costume design (thanks to Sarah Porter and Marcy Wiegert) that is not to be missed. 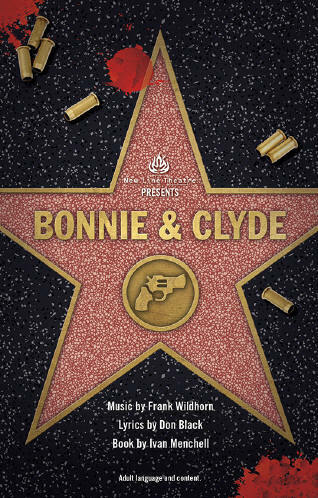 New Line Theatre’s BONNIE & CLYDE runs now through October 25. 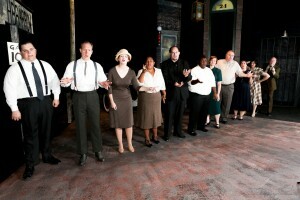 For more information and to buy tickets, visit NewLineTheatre.com.